I thought this would be a great way to get me building this kit at a much quicker rate then normal. I have done a bit of work on the cockpit (instrument panels, seat, cockpit floor) and will post some pictures later of the initial work. Using the Eduard PE really adds to the detail and I get to use my Hold "N" Fold as well. I have never entered a group build before so this should be fun and as I said will keep me accountable to a time frame. Glad to see you enter GB. Looking forward to your pics. Welcome to the GB! Glad to see another SBD here, sounds like a very nice kit. Welcome to the GB Bob. Can not wait to see your work on the SBD. Welcome aboard Bob. Show us some pics when you can! Welcome aboard Bob. I hope to see afew photos soon.Great choice too. I look forward to seeing this build. I'm working on the -3 so yours will be fun to watch how it comes together with all the pe. Looking forward to seeing some pics of your SBD build, Bob! Here is the Pilots instrument panel built up modifying the kit parts and substituting Eduard PE which creats a great 3-D effect as the istruments are one level and the panel front glues on top of the instruments. The last thing I will do is use Future or other clear product to simulate the glass covering the dials. More pictures to follow but I can only do one or two per post due to the 100KB limit. 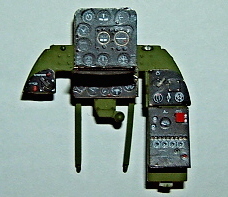 The second photo is the bulkhead at the back of the rear gunners cockpit. The boxes on the upper level are ammo boxes that are placed on the rear gun. Each box is made from a flat PE that needs to be bent, formed, and glued, then placed in the "shelf" which is another PE part. 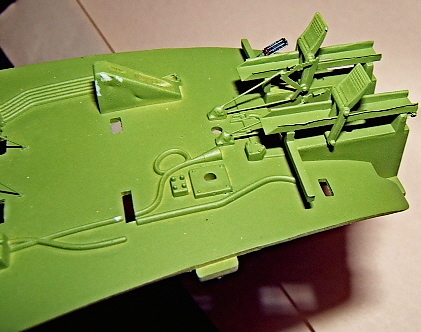 Here is the cockpit floor showing the forward portion of the floor and the detail of the rudder pedals and mechanisms. The rudder pedals and mechanism are modified using Eduard PE parts. Parts C15 and C14 are replaced with PE and wire to yield a much more intricate appearance. The foot troughs are Eduard PE as well. The next two post will show more of the cockpit floor. I decided to add just one more shot of the cockpit floor which is from the side which accentuates the rudder detail and the fine wire used to replicate the wire mechanism. The second piture is two instrument clusters situated between the pilot and gunner. 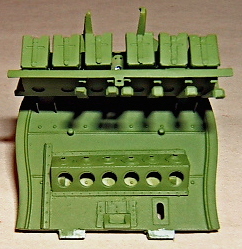 A large portion of the kit parts were removed to create these very detailed pieces with the main modification elimination of the plastic beams replaced by PE. The trick will be coming up with a means to attach these to the cockpit though I think I have a good solution. I'll let you know how I accomplished that task once I have it complete. Outstanding progress! I know that you spoke a little French while working with the Eduard PE parts. You obviously have patience and talent. The instrument panels are exceptional. Please keep us posted. This is an outstanding kit. BTW, which paint and decal scheme did you decide upon? Those rudder pedals and troughs look way better than the kit parts. I like the ammo boxes too. Excellent work! That IP looks especially nice. I think I am going to go with the Marine Air Group scheme as it is a bit different with the yellow wings and light gray for the rest of the plane. I like the fact there is color in that particular layout. I'll be posting more pictures today.